Students with depression often face added challenges that can lead to lower grades and higher drop out rates. IowaWatch reporters Linh Ta and Rana Moustafa spoke with Iowa college students diagnosed with depression who said it impacted their performance in the classroom, but they often feared to reveal their struggles because of the stigma associated with the disease. Depression affects nearly 19 percent of students nationwide, according to data from the National College Health Assessment. This IowaWatch report shows counseling services at Iowa universities still have some challenges to overcome, including improving outreach and educating faculty about working with students who have depression. Anxiety, depression and stress are reality for Jordon Deutmeyer, a 23-year-old University of Northern Iowa student who has dropped out of two schools, attempted suicide, and failed a multitude of classes. “I just remember trying really hard in all of my classes,” Deutmeyer said. “I never skipped, I never did anything, I tried really hard. I would just get C’s back or fail. Recent University of Iowa graduate, Alyson Brown, sits in the UI Main Library fourth floor. She came here as an undergraduate when she felt overwhelmed and needed time alone. And although she graduated from college in December getting there while dealing with depression made school a lot more difficult. 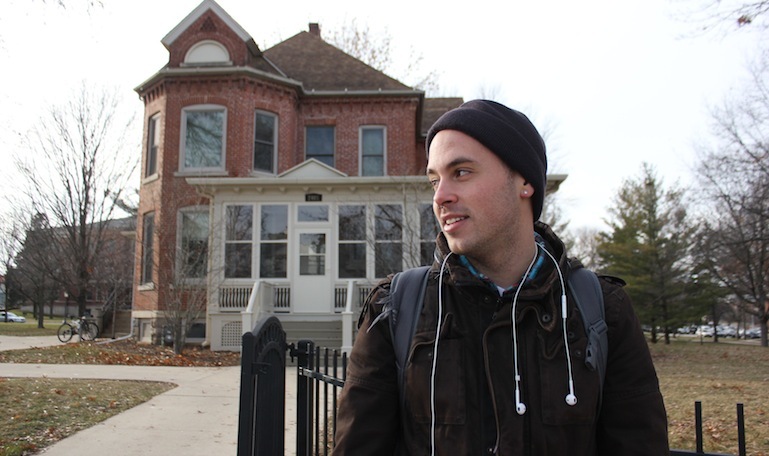 College students with depression often run into more difficulties than the typical student. Those who struggle the most don’t connect with the help they need. Sometimes, their disease is invisible because many don’t feel comfortable informing their professors or friends about their condition and their symptoms often get misread as poor classroom or social performance. The National College Health Assessment, created by the American College Health Association, measures aspects of student health, including symptoms of depression, anxiety disorders and stress. 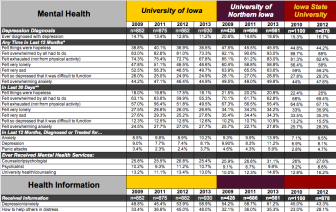 IowaWatch collected data from the three Iowa regent universities along with the national data. At times, Alyson Brown can’t eat or sleep. Some days, she sleeps for hours during the day.